on November 29, 2017, 9 a.m. When people look for love, what is thing they prize most highly? A new 20-country YouGov international study examines which attributes people most prioritise in a partner. The results are good news for the romantics, as across the planet personality is prized ahead of looks. Here in Singapore, personality is by far the most important attribute. Among both men and women, 50% rank having "a personality I like” as the characteristic they prioritise most highly in a romantic partner (and a further 22% rank it as the second most important). Sense of humour comes next, with 24% ranking it second (along with the 16% of women and 8% of men who rank it first). 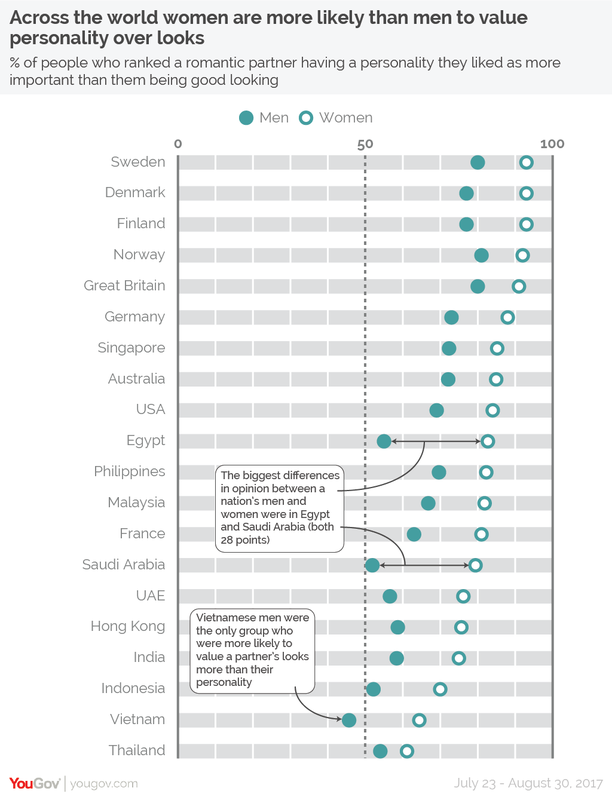 Men and women differ most on the importance of looks, as Singaporean men place a noticeably higher stock than women in a partner’s physical appearance. While 70% of men rank good looks in their top three priorities, this figure is just 30% for women. The battle between looks and personality is a classic dating dilemma, and the research shows that Singaporeans overwhelmingly come down on the side of personality. 85% of women in Singapore rank personality as more important than good looks, whereas 72% of men say the same. The preference for personality over looks is replicated across the globe. the overall results in every country surveyed show that people are more likely to rank personality as more important than good looks. The only deviation from this trend comes among Vietnamese men among whom only 46% rank personality more highly than good looks (compared to 64% of Vietnamese women). In each of the 20 countries studied women are more pro-personality than men. This difference was most pronounced in Saudi Arabia (where 79% of women ranked personality more highly than looks, compared to 52% of men, a difference of 28 points) and Egypt (83% of women compared to 55% of men, also a difference of 28 points). Women in the Nordic countries place the most stock in a partner’s personality – it is ranked as the single most important attribute by 73% of Swedish women, 69% of Danish women, 66% of Norwegian women and 59% of Finnish women. By contrast, those who are most fixated on looks are Vietnamese men (44% of whom ranked it is the single most important characteristic a partner could have), Indonesian men (35%), Saudi Arabian men (also 35%), Thai men (33%) and Hong Kong men (also 33%). The study finds that the countries where a partner having decent financial means is the most valued attribute are Malaysia (where 36% of women ranked it as a top-three priority), Vietnam (32%) and Indonesia (30%). However, it should be noted that in all of these countries (and, indeed, all countries surveyed) women are still much more likely to rate a partner’s personality, sense of humour and intelligence as a more important attribute than wealth.